Organizing Upgrade is honored to offer a preview of this insightful reflection on organizing – Engaging the Crisis: Organizing Against Budget Cuts and Building Community Power in Philadelphia – which will appear in Left Turn magazine #36 (April/May 2010). You can subscribe to Left Turn online at www.leftturn.org or become a monthly sustainer at www.leftturn.org/donate. On November 6, 2008, just days after Philadelphians poured onto the streets to celebrate the Phillies winning the World Series championship and Barack Obama the US presidency, Mayor Michael Nutter announced a drastic plan to deal with the cities $108 million budget gap. Severe budget cuts were announced, including the closure of 11 public libraries, 62 public swimming pools, 3 public ice skating rinks, and several fire engines. Nutter also stated that 220 city workers would be laid off and that 600 unfilled positions would be eliminated entirely, amounting to the loss of nearly 1,000 precious city jobs. In classic neo-liberal style, the public sector was to sacrifice, while taxpayer money would bail out the private banking institutions. Well before the economic crises of 2008, a decades-long process of economic restructuring and deindustrialization had left Philadelphia, with a population just over 1.4 million, an incredibly under-resourced city. Philadelphia has the highest poverty rate out of the ten largest cities in the US, an eleven percent unemployment rate and a high-school dropout rate that hovers dangerously around 50 percent. Nutter’s administration set up eight townhall meetings across Philadelphia, designed to calm the citywide uproar. Thousands of people filled the townhall meetings poised to question how such drastic decisions were made without any public input. Under the banner “Tight Times, Tough Choices,” Mayor Nutter and senior city officials attempted to explain the necessity of such deep service cuts. They explained that the impact of the economic crisis on the city had only become apparent in recent weeks, and because the city could not raise significant revenue to offset its financial loses in the timeframe that was needed, rapid cuts were mandatory and effective January 1, 2009. Initially a non-profit advocacy organization, the Friends of the Free Library (FFL)—itself largely funded by the city—coordinated the opposition to the mayor and positioned itself as the leader of the struggle by attempting to negotiate with the City. Without community input, FFL proceeded to put forth a series of low-level demands calling for “shared sacrifice” and a three day-a-week schedule for the entire library system. Having established itself as a mediating force, FFL’s centered its efforts around media attention and backroom negotiation, shying away from any community organizing or alternative legal and civil disobedience strategies. Community leaders, rooted in the neighborhoods where libraries were about to close, decided they could not afford to settle with the FFL’s “shared sacrifice” strategy. 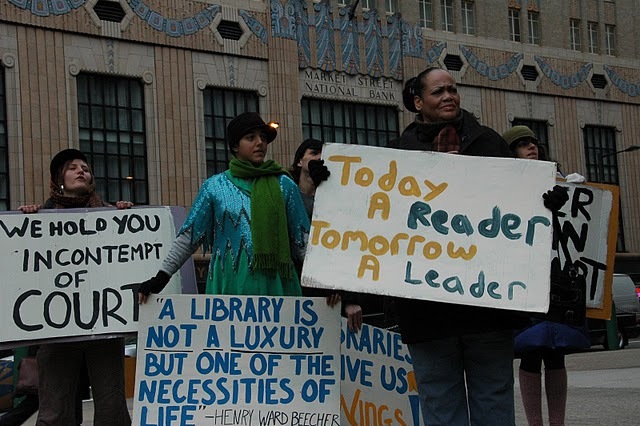 People who organized the very first rallies to defend their neighborhood branches came together with a broader layer of organizers and activists who wanted to support the fight against the budget cuts and the Coalition to Save the Libraries (CSL) was formed. The CSL quickly set up a working group structure, loosely based on a spokes-council model that allowed for a multiplicity of work to happen simultaneously. We divided into working groups representing our tactical focuses; media, action, outreach, and influencing decision-makers. Each working group included a mix of people, some experienced in a particular area and others who were coming to the work for the first time. Members taught each other how to draft media talking points and phone scripts for outreach calls, prep meeting agendas and media spokespeople and write press releases for actions at City Hall. With the intention of structuring the leadership of those most affected by the budget cuts at the center of the organization, CSL formed a coordinating committee where multi-racial and cross-neighborhood membership was prioritized. Weekly meetings featured rotating co-facilitators, usually paired across difference as way to underline the importance and power in multiracial and intergenerational organizing in Philadelphia. The CSL was born just weeks before the libraries were mandated to close, which left us with a very short timeline and very high stakes. Organizing in the midst of the economic crisis was fast-paced, anxiety-ridden and offered little time to think about long-term vision and strategy. 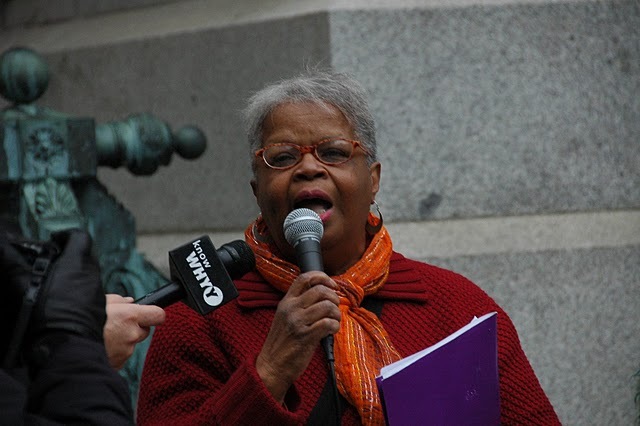 Nonetheless, CSL’s campaign to keep the libraries open and fully functional consistently attempted to combine short-term demands with a long-term vision for educational and economic justice. 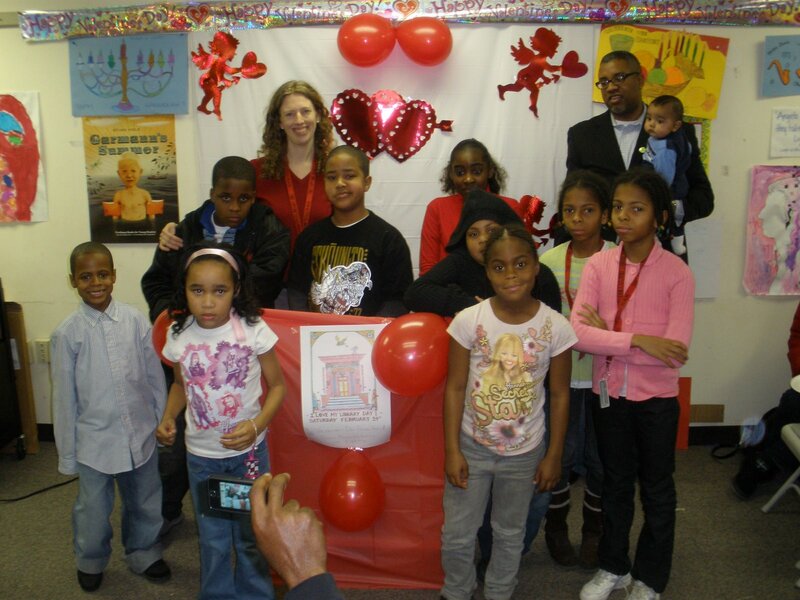 The Coalition argued that defending community access to public educational resources—computers, books, librarians—becomes even more important in times of economic crisis, especially in light of how many low-income neighborhoods in Philadelphia have been systematically stripped of these resources over the last few decades. While the Mayor was proposing stark neoliberal solutions—including a proposal to sell the eleven library buildings and turn them into privately managed “knowledge centers”—we were demanding that public services be considered common, neighborhood-owned institutions. A common refrain of the CSL has been, “You can’t close these libraries because they are not yours to take!” Looking for more action oriented strategies to involve people outraged by the Mayors proposal, the CSL began to create a community budgeting process for Philadelphia by establishing a ‘People’s Court’—a series of actions outside of City Hall coinciding with the opening day of legal hearings, which stated that it was ‘illegal’ to close down the 11 libraries. By bringing different people from different neighborhoods together the Coalition built a very real feeling of collective power. Sheila Washington recalls: “I was invited to a Coalition meeting and it was wonderful because I was so stressed out. They were removing books and packing up our library. They were moving the after-school program. And I thought, oh my God, what is this neighborhood going to do?” Organizing to defend the libraries helped us cope with the incredibly difficult economic times, together. The budget cuts were coming down in multiple neighborhoods across the city, mostly low-income neighborhoods, and by building alliances among people who were experiencing the affects of these budget cuts our organization replaced feelings of isolation and shock with feelings of strength and a belief that together we could win. What ultimately stopped the eleven libraries from closing, was the combination of CSL’s short term demands along with its long term vision and popular organizing strategy targeting multiple pressure points. The Coalition accurately assessed the moment and turned widespread anger around the budget cuts into an organized power base; we helped file a lawsuit against the City and organized turnout at legal hearings; and we seriously prepared for a library takeover in the event that the lawsuit failed. Together, the CSL implemented a successful model of crisis-response organizing, by channeling popular outrage into a strong, unified cross-neighborhood force that framed the debate in terms of economic and racial inequity. Even after winning the court injunction, Philadelphia is still struggling with constant staffing shortages and reduced operation hours due to an $8 million budget cut to the library system. As the library campaign drew to a close, the CSL redirected its efforts to protesting pool closings, attempting to grow and develop into a multi-issue organization. It was a logical extension of our initial work, as the pool closings affected the same constituencies that were hit hardest by the library closings, poor and working people of Philadelphia. Because we see this as a long-term struggle, we’ve been working to transition our organization from a crisis-response, single-issue coalition into a multi-issue, long-term grassroots institution in Philadelphia. In order to build for the long haul as an organization, we have continued to tie the budget cuts together and show how they are interconnected, train and develop our leaders, and maintain our cross-neighborhood network. This article is part of our effort to document and reflect on our work as we gear up for the US Social Forum in Detroit this summer. Our city is in dire need of multi-issue grassroots organizations that are led by poor and working people fighting for social and economic justice and oriented towards organizing to build power in our communities. Kristin Campbell wrote this piece in collaboration with Andalusia Knoll and with additional help from Alia Trindle and Sarah Small. inspired by Eleanor Childs, Sherrie Cohen, Sheila Washington, Carolyn Morgan, Katrina Clark, Gregory Benjamin and Betty Beaufort. I am trying to get this case much needed attention.